+ FREE Portion of Pasta and a Beer in the evening! Sunny PRIVATE ROOMS - with balcony. 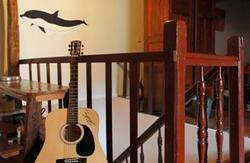 For artistic travelers who want make a performance at the hostel we offer a free night stay! in the LONELY PLANET guidebooks are WRONG! Please stick to the directions provided below. Take 'Hristo Botev' (?????? ?????) blvd, in 5 minutes you will cross a bridge at 'Slivnitsa' (????????) blvd. Keep walking straight and stop at the intersection called 'Makedonia' square (?????? ?????????). Landmark when you are there is a tall building on your left. At the intersection turn right and you will see a 'Win Bet' casino and a 'Post Bank' office. Right after the bank there is a small metal door with a Hostel Mostel sign on it. Ring the bell, we will open the door for you. 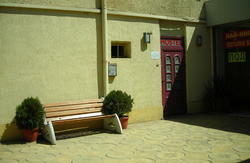 Walk through the arcade and you will see our traditional building with a wooden terrace. First of all buy two tickets - 1.00 lev (0.50 Euro) each (one for you and one for your backpack) from the nearest newspaper kiosk. Then take a tram No 1, 6 or 7, direction to 'Makedonia' square stop - the 4th (Ploshtad Makedonia spelled in Bulgarian). Look for 'Win Bet' casino and a 'Post Bank' office there. We are just next to it. Don't take a taxi from the train station! You can find cheap taxis in front of the MAIN entrance of the bus station only - it is 100m to the left from the train station. Distance to the hostel: 1.5 km, an honest fare is 0,80 Lv/km (written on a sticker on the cab window). The total fare should be no more than 5 leva. It is just next to the Central railway station so use the directions given above. NEVER accept taxi offers at the train or bus station! Too far & boring, not recommended! You can use our pick-up service. Write us an e-mail with your flight number together with the expected arrival time. For the pick-up we charge additional 20 Leva (10 Euro) during the day and 30 Leva (15 Euro) between 22:00 and 07:00. Buy two tickets from the newspaper kiosk in the departures terminal or from the bus driver (although sometimes the driver has no tickets) - 1.00 lev (0.50 Euro) each (one for you and one for your backpack). Take bus No 84 to the city center. Punch the 2 tickets. Get off the bus when you see Starbucks Coffee on your left and a park to your right. Getting off the bus take 'General Gurko' str and walk straight until you see McDonalds on your left and a building with lions on the right. Keep going and you will reach Makedonia Square. Look for 'Caesar' casino and a 'Post Bank' office there. We are just next to it. To avoid scam go to the desk of 'OK Taxi' at the terminal and request a cab to our address. The distance to the hostel is15 km, honest fare is around 15 Lv (7.5 euro).